Jersey City Self Storage at 69 Mallory Ave. 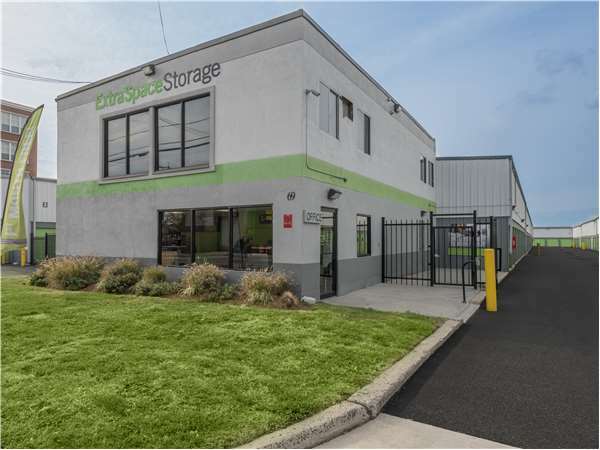 Located on Mallory Ave. between Claremont Ave. and Clarke Ave., Extra Space Storage serves Jersey City residents near Hackensack River Waterfront, Bergen/Lafayette, West Side, McGinley Square, and Greenville. Locals will recognize our facility near WHOS Gluten Free and Wazalendo Convenience a few minutes east of Hudson Mall. We're also accessible for residents of nearby apartments, such as Bostwick Court, Salem Lafayette Apartments, Bramhall Avenue Apartments, Ocean Green, and 38 Randolph. Our Mallory Ave. location is less than a mile from New Jersey City University, so we're a great option for college students who need self storage over the summer or while studying abroad. Extra Space Storage on Mallory Ave. is the self storage solution for you in Jersey City. We can handle a variety of needs with a large selection of storage unit sizes and amenities like vehicle storage. Our Jersey City storage facility offers storage unit sizes from 3x3 to 10x50 with features like indoor access, drive-up access, first-floor access, elevator access, outdoor vehicle storage, and reduced height. Need to store a car, motorcycle, boat, or RV in Jersey City? Extra Space Storage offers 10x20 outdoor parking spaces and 10x15 to 10x50 drive-up units that can accommodate vehicles of all sizes. To protect our customers and their belongings, our Mallory Ave. storage facility has 24-hour video surveillance, electronic gate access with personalized entry codes, and an on-site resident manager. At Extra Space Storage, we believe our customers deserve the best. From our friendly, professional staff to our well-maintained, secure, and clean facility, we go above and beyond to deliver a high-quality self storage experience. Contact us today to reserve a storage unit in Jersey City! If you need someone to who is knowledgable and can really give you input on what you need this is the perfect spot and Andy is the guy to see. If you are looking for a storage place Extra Space Storage far surpasses the competition! Why? Superior customer focus of its team members, Seamless on-boarding experience into the facility and customer ease of use. Cleanliness and well maintained facility. Extra Space Storage is the winning ticket in auxiliary storage facilities. Extra Space Storage Rocks! Extra Space Storage is amazing. It’s convenient in my time of need. From the customer service rep to the location rep I’m satisfied with the friendliness. My unit was covered in rodent feces and mold upon move out. Will never rent here again. It was definitely not worth the thousands I spent. Jennifer, was a very respectful, accommodating and helpful employee who attended to my needs. And that is very important for a customer. I would recommend a this storage!!! Great prices. Staff are helpful! This particular site is older so there are no marked parking spaces so it is a crap shoot sometimes. Elevators are far from some units. This site fits my needs well as it is local and affordable. Great storage, caring workers, and clean facility what else could you ask for! Very clear, and helpful. Clean facility. Extra space storage is a great place bease they have great nd many sites and storage space give them a try come on down. . The Staff was very helpful and willing to go the extra mile! The facilty is convenient and the staff is very polite and knowledgeable of the business. I had a personal but minor issue which I believe that they will resolve in a timely manner. Take NJ Turnpike (Rt 95) South to exit 15E towards Jersey City. Keep Right at the fork. Follow Signs for US 1 Truck North US 9 Truck North Bayonne/Jersey City. Merge onto US 1 Truck North US 9 Truck Raymond Blvd. Continue straight on Communipaw Ave. Turn Right onto Mallory St. Destination is on the Right. Take NJ Turnpike (Rt 95) North to exit 15E towards Jersey City. Keep Right at the fork. Follow Signs for US 1 Truck North US 9 Truck North Bayonne/Jersey City. Merge onto US 1 Truck North US 9 Truck Raymond Blvd. Continue straight on Communipaw Ave. Turn Right onto Mallory. Destination is on the Right. Take Rt 80 East towards US 46 NYC. Keep left follow signs for 80 East NYC. Use right lane to continue towards 280 East. Keep right at the fork to continue on exit 47A follow signs for 280East Oranges Newark. Continue on 280 East. Keep left on 280. Take NJ Turnpike South to exit 15E towards Jersey City. Keep Right at the fork. Follow Signs for US 1 Truck North US 9 Truck North Bayonne/Jersey City. Merge onto US 1 Truck North US 9 Truck Raymond Blvd. Continue straight on Communipaw Ave. Turn Right onto Mallory. Destination is on the Right.